However, in Catalina, where I visited last weekend, this was one of the ONLY cars they drive. These Golf Carts are the primary source of transportation around the island of Catalina, California. They don't go very fast, but then again, there's no reason to here. It's a small island, only 22 miles long, and the largest city (Avalon) holds about 8/10ths of the population on the island. The towns are small, cramped even. It feels much more like a Carribean island. Enough of that, here's the kicker: If you live on Santa Catalina Island, you must wait FOURTEEN years to import a car. Yes, 14 years. "Wow I really like the 1999 Toyota Supra! I really want that car here." Well sir from 1999, you would have to wait until 2013 to bring ANY car here. Enjoy your golf cart. The workaround to this, is either to shut up and drive a golf cart, or register one of these: A KEI TRUCK! Yes, in Catalina there are Kei trucks everywhere! 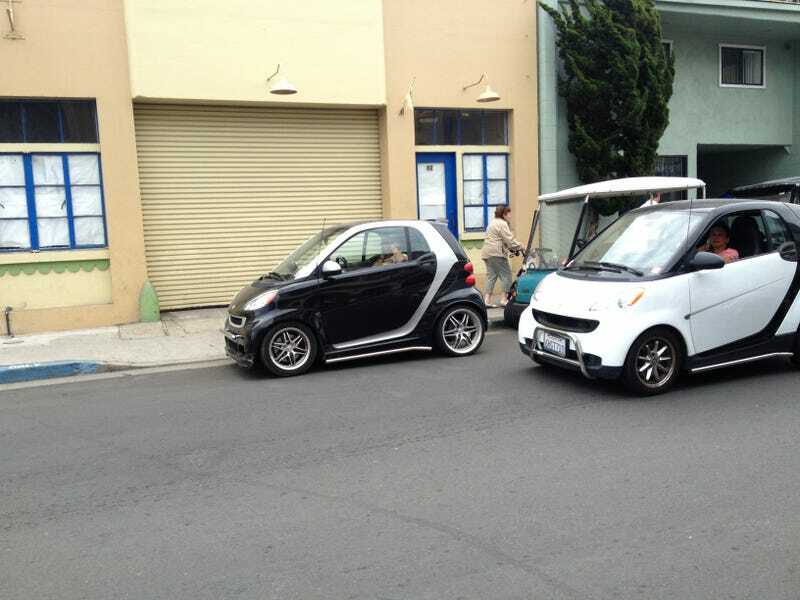 People register them as golf carts, which is awesome. This particular model is a Daihatsu pickup, come on, don't you want one? This is a Tiger Truck, one of the more popular models on the island. (Sorry for the crappy picture, I took this on the back of a golf cart.) It is made in China and comes in three wheeler truck form, four wheel van form or four wheel truck form. You can get them in EV, gasoline, or E85 options. They're freaking cool. Of course there's your fair share of pranksters. Here's a nice example of a Mercedes-Benz Changan F350. Legit, right? That's not to say there's no real cars on the island. I saw quite a few Subaru Bajas on the island, probably chosen because of their All Wheel Drive, smallish size and large bed. I also saw a few Jeeps, lifted Rangers, Toyota Tacomas, things of that nature. (Pardon my finger) Classics are very popular, too. Old Minis and Volkswagen Type-II buses were the norm for cars, but sometimes I found gems such as this GMC van. This bus was old, cool and HUGE.